This delicious recipe proves that porridge doesn't have to be boring and will keep you feeling full all morning. 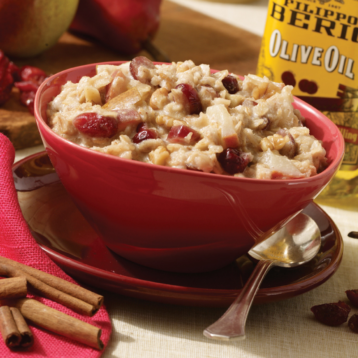 The combination of cranberries and pears is perfect for a nutritious and warming breakfast. Definitely worth getting out of bed for! In saucepan, combine milk, olive oil, cranberries, cinnamon, nutmeg and salt; bring to boil over medium heat, stirring occasionally. Add oats and pear; simmer, stirring occasionally, for 5 minutes or until most of the liquid has been absorbed. Remove from heat; stir in sugar, walnuts and vanilla.